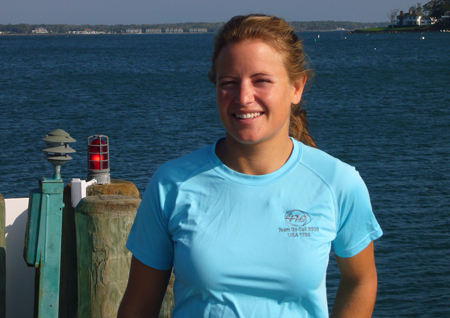 OLIVIA STERLING PHOTO | Olympic sailor Amanda Clark on Shelter Island in 2008. Shelter Island’s Amanda Clark and her crew Sarah Lihan placed 11th overall in the 470 women’s competition at the Skandia Sail for Gold Regatta in Dorset, England last week and is now looking to make a move for an Olympic berth at the next qualifier in Perth, Australia in December. “We’re definitely in this. We’re exactly where we want to be,” Ms. Clark said of her finish in the first of two Olympic trials that will determine who races for the U.S. team in England in 2012. The regatta ran from June 3 to June 11 and drew competitors from around the world. Ms. Clark said she and Ms. Lihan had been sailing together only since late winter and her goal in England last week had been to “stay close” to her U.S. competitors, Erin Maxwell and her crew Isabelle K. Farrar, who finished in eighth place. With the Perth event five months away, Ms. Clark said she and Ms. Lihan had lots of time to prepare. They next will race in the European championships in Helsinki next month and in November head to Melbourne, Australia for the Sail Melbourne World Cup. In between, they’ll practice in England in July, Buzzard’s Bay in November and Miami in October. All three locations are expected to have windy conditions like those they’ll face in Perth. At the end of sailing, New Zealanders Jo Aleh and Olivia Powrie had secured the regatta gold medal. There was a tough battle for the other podium positions, with Camille Lecointre and Mathilde Geron (France), Hannah Mills and Saskia Clark (Great Britain), and Gil Cohen and Vered Bouskila (Israel) within 11 points of each other at the outset. Mills and Clarke secured the silver with a third place, leaving Lecointre and Geron with bronze after they could managed an eighth. Cohen and Bouskila had an even worse day, finishing dead last and slipping to fifth. Maxwell and Ferrar were the only Americans to place in the top 10 in the 470 women’s competition. Athletes from the U.S. Sailing Team AlphaGraphics, of which Amanda is a member, won two medals in women’s match racing: gold for Anna Tunnicliffe, Debbie Capozzi and Molly Vandemoer; and bronze for Sally Barkow, Alana O’Reilly and Elizabeth Kratzig Burnham. Mark Mendelblatt and Brian Fatih won the Star class medal race and Zach Railey took a second in the Finn medal race.